Mission: Heartland Alliance advances the human rights and responds to the human needs of endangered populations – particularly the poor, the isolated, and the displaced – through the provision of comprehensive and respectful services and the promotion of permanent solutions leading to a more just global society. 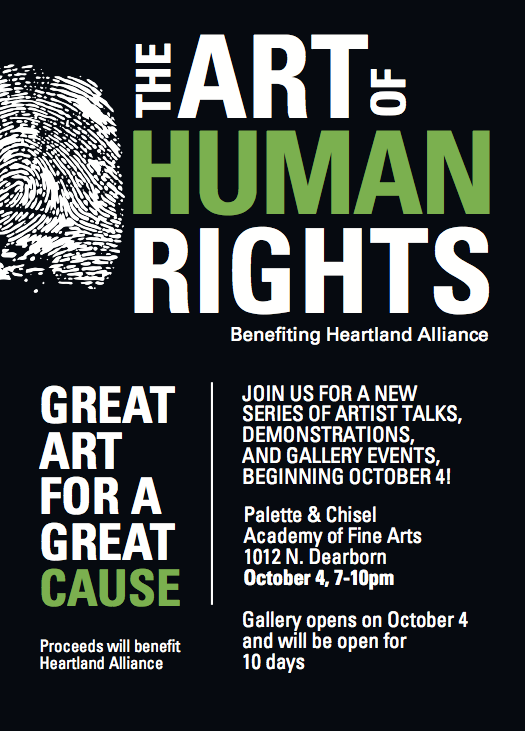 Proceeds from The Art of Human Rights benefit the end of poverty. Artist Demonstrations: Saturday, October 5th from 11am-3pm and Sunday, October 6th from 11am-3pm at Palette & Chisel. This entry was posted in Openings and Events and tagged art, Arts, Chicago, Heartland Alliance, Palette & Chisel. Bookmark the permalink.